Because I work in IT, I end up getting a lot of questions that deal with technical support, such as how do I unfreeze or reset my iPod device! I’m not sure why so many people have been asking me that lately, but since they are, I thought I would write up a quick post on how to go about resetting your iPod if it has frozen up! Of course, telling you how to reset an iPod Nano may work for some, but not for those who have an iPod Touch, so I’ll try to list out the instructions for as many as I can! Here we go! One other thing to note is that if the resetting procedure does not work, you can also try to connect the device to a power source and then try again. Note that you might first see the “Slide to Turn Off” option appear on the screen, but that’s ok. Keep holding the two buttons and then the iPod Touch will turn off completely. Then simply press the Sleep/Wake button again for a few seconds to turn it back on. Another thing to note is that this is the same procedure for resetting an iPhone or an iPad also. To reset the 6th generation iPod Nano, you have to hold down the Sleep/Wake button and the Volume Down button at the same time for at least 8 seconds. 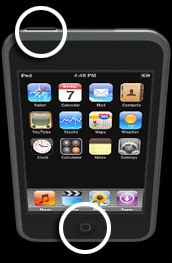 For the iPod Nano 7th generation, shown below, you have to press Sleep/Wake button and the Home button until the screen goes black. 2. Now press and hold the Menu and Select buttons until the Apple logo appears, which could take from 6 to 10 seconds. You might have to perform this step several times. You can also reset an iPod Mini in the same way as the above steps. 1. First , eject your iPod shuffle from iTunes, if you have it connected. 2. Then remove the iPod shuffle from the USB dock. 3. Move the switch that is on the top or side of the iPod shuffle to the off position. You know you are in the off position when you can’t see the green stripe. 4. Wait 5 seconds. If you have the 3rd or 4th generation iPod Shuffle, wait 10 seconds. 5. Move the switch back to the on position so green stripe will be visible in either position. And that’s it! Hopefully, now that you know these steps, you don’t have to keep taking out the battery to unfreeze your iPod! Any comments or questions, make sure to write below! Enjoy!